Best skullcandy earbuds you should pick? Despite being known for being celebrity-endorsed earbuds headphones, SkullCandy gained the popularity for their cheap price, impressive styles and sound qualty, and they might have become a trendy fashion accessory. What made them gain that popularity? Possibly because Skullcandy came up with the idea of bringing the music, fashion and action sports lifestyle together. Skullcandy earbuds focus on colors, enhanced volume and material to improve the comfort and make ’em different from most earbuds on the market. But does that mean they sound better than the competion? In this post we’ve rounded up four of best SkullCandy earbuds for both audio performance and design. Bluetooth earbuds are trending audio products, if you look to buy Skullcany earbuds, you may want to pick the Bluetooth models. Bear in mind if you don’t like neck-band style design skip this set. But if you like it this headphone typically known for colorful and unique skull logo will be the next beats for your favorite tracks. The Method Wireless’s sound tends to focus on bass, but I can’t say it’s a heavy bass headphones the bass impact isn’t huge and it isn’t crisp enough. The treble is quite subtle and It wasn’t impressive for clarity and brightness. Fix In-Ear SkullCandy is a lightweight and comfortable in ear headphone (It has a sensitivity of 102 dB and a 16 ohm impedance). It also packs a lot of bass. The Fix In-Ear flashy earbuds come with an ergonomic shape, and available in different colors. Skull logo are decorated on both eartips and earbuds cases. Fix In-ear’s sound quality is somewhat lack of detail, but don’t worry it will be able to rock any songs. Bass is decent and beefy, fortunately I found it is not as good as Piston 2. As advertised for sports, these light and small working out earbuds are suitable for a lot of daily life activities and probably it will become as a part of your style. Three models bring out the similar design concept of SkullCandy earbuds. Apparently, Fix in-ear model has been particularly improved in design of earbud housing. SkullCandy Supreme Sound system, a huge revamp, was integrated in these earphones as advertised it has the unique sounds that only exist in SkullCandy brand. With Skullcandy silicon earbud tips, noise-isolating performance is quite good and it’s very useful on the go. In term of sound quality, its bass is just acceptable (not as good as Sennheiser CX200 Twist-to-Fit Earbuds–deep and fairly powerful), and the treble is a little crunchy. Claimed as the best sellers earbuds in America, this is a typical earbuds for under 30$ but has a level of sound quality that you can realize. Another set of best sellers of Skullcandy maker, Skullcandy INK’D, these lightweight and small size earbuds offer comfortable fit and good noise isolation. Aside from stylish design and variety of colors you can choose from, INK’D sounds good for the price, which stands for clarity in all registers, but not very blanced. Like other enty-leve earbuds, its bass is obtainable, and another downside is that sound distortion is fairly noticeable in the upper mids and highs. Finally, the soundstage is not quite open . SkullCandy Fix In-Ear Earbuds w/ Mic3- 3.5 stars. First of all, those SkullCandy earbuds are well designed. The represent the combination of the enhanced colors and unique shape is really eye catching, which can make people perceive it as fashion accessories. 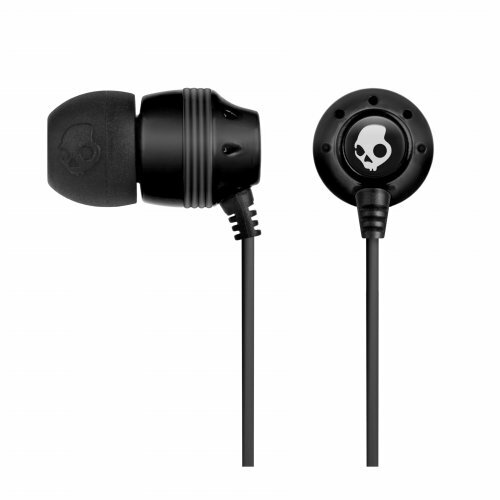 As you can see some skullCandy earbuds are identical but they come with many playful colors, together with the icon, whitle skull in black background. Shine bright like skullCandy earbuds!– youngers would appreciate the flashy designs. You can get more features from Fix In-Ear Mick skullCandy earbuds such as a line-in remote control, microphone, an receive call button, navigate tracks, and adjust the volume. Skullcandy Earbuds are pretty durable. Working out requires earbuds have to stand to rough condition like sweat and cable bouncing. If you drop Skullcandy earbuds or accidentally stretch the wires, they will be fine. Other innovative design of cable and plugs can be seen as an important points for how long skullcandy earbuds last. They may not sound as good as they look. Everyone like the good sound quality that perhaps Skullcandy earbuds falls behind other competitors at the same price range, some lacks of details; other miss to deliver bass, but they stand out for lots of colors and lightweight. What most people may be keen on Skullcandy earbuds is their affordable price, sound quality, durability and fashionable style. Another reason, probably, is many artists/DJs own those. Getting something that under their real values is a very nice experience, I mean you can pay less money than product actually cost, and Skullcandy earbuds have took major steps to fulfill that value. Skullcandy earbuds do not give very good sound as some earbuds cost under $30, but they satisfy you by the price, stylish design, average sound quality, and the convenience for your lifestyle. Skullcandy earbuds also make wearers feel that these items are related to their colorful clothes and styles. Earbuds need to be better fitting to improve listening experiences, and earbud tips work that out. However, SKDY earbuds are often supplied with 2 or 3 pairs of stock eartips, so it is possible that you may not find the best fitting to your ears. Some SKDY earbuds come with foam tips–better noise isolation and more comfortable. You see today a lot of Hip-hop or dance artists wearing Skullcandy earbuds to mix with their outfit. The ideas from SkullCandy are come up with, some sort of making the accessories that match to users’ life style, especially young people rather than deliver a blow-out mind sound quality. They are not always celebrity-endorsed earbuds, some apparently sound good. However, in fact, you might have found some of them sound never better than earbuds packed with your smartphones. All SkullCandy earbuds are light weight because the plastic built. They cost less than $50 and nearly give all your needs for an active lifestyle. When deciding to buy your should consider what is it for? to work or work out. On the road like running or traveling, seating in the quiet room just to relaxed or in exercise room. Some in-ear headphones work great in the silent room but when listening in the noise areas the sound quality is degraded significantly if noise-isolating is not good. There are some common factors to consider: noise-cancelling or noise-isolating, comfort, wire or wireless, good fit (not falling out so often), bass response, full-range sound, purity, clarity of treble. Specifically if you are workout enthusiast, you just need secure fit and good bass or wireless earbuds (if you don’t like wire around your body).